(CBS/AP) Police in Italy, Switzerland and France searched on Sunday for 6-year-old twin girls who disappeared after their father died in an apparent suicide. The body of Matthias Kaspar Schepp, 43, a Canadian-born resident of Switzerland, was found by a railway station near the southern Italian port city Bari shortly before 11 p.m. on Thursday, according to Swiss police in the canton (state) of Vaud. Authorities believe Schepp, who was separated from his wife, threw himself under a train. Police in Switzerland, Italy and France are searching for the twin girls, Alessia and Livia, who lived in Lausanne with their mother, Irina Lucidi, 44. 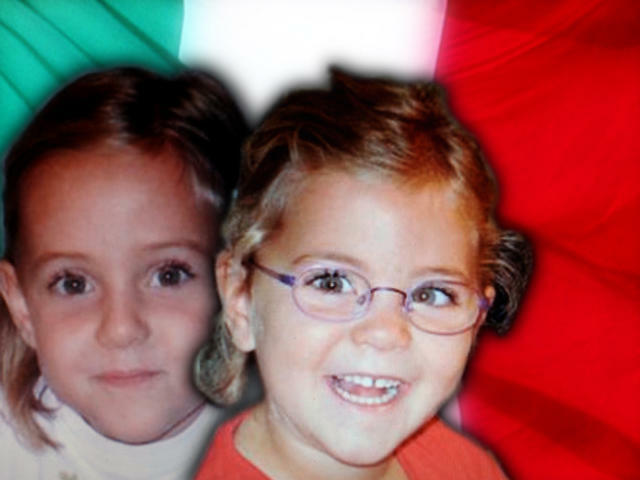 According to Italian news reports, Schepp picked up his daughters from their mother's home on Jan. 28 for the weekend. Swiss police say Schepp, rather than returning the girls to their mother, took them when he left his home in St. Sulpice, a suburb of Lausanne, on Jan. 30. Both girls were described as wearing glasses and blue jeans, with Alessia bundled in a white jacket over a striped shirt, and Livia dressed in a purple ski jacket over a green T-shirt. Swiss authorities say they alerted all European police that the girls were missing on Jan. 30. Interpol also was notified. Swiss police say an initial investigation has determined that Matthias Schepp drove the girls in a Swiss-registered Audi A6 through Annecy, France, on Monday and on to Marseille on Tuesday. After leaving Lausanne, Schepp turned up in Marseille and Toulon, France, before showing up in Italy, Italian police official Alfredo Fabbrocini said. Schepp apparently made some large cash withdrawals in Marseille, but it is not yet known whether he took the girls to Italy with him. Rescue volunteers in the Italian Alps were searching a water tank near the train station where Schepp's body was found for the two missing girls. "There's a gap of a few days," Fabbrocini said, adding that police were trying to track down the man's movements through cash withdrawals, CCTV, witnesses and phone calls. Authorities have urged anybody with information to come forward. The search has included helicopters and dogs, according to ANSA, the Italian news agency. A Facebook page set up to find the girls invites people with information to make contact. According to the Facebook page, authorities are now investigating whether he took the girls from Marseille aboard a ferry to the French island of Corsica. He sent his wife a postcard from Marseille saying he could not live without the girls, and Fabbrocini said Schepp's will had been found in his house in St. Sulpice. Several dozen people gathered over the weekend in St. Sulpice to march in solidarity with and express concern about the missing girls.